On Sunday October 3rd, The National Eating Disorders Association [NEDA] held its 2nd Annual NYC NEDA Walk. The event raised approximately $140,000 with more than 700 people in attendance! NEDA ambassador, plus-size model and America’s Next Top Model winner, Whitney Thompson, participated and helped carry the walk banner at the front of the line. Reality star Karen Biehl, of the upcoming new series on NYC life (channel 25) called “Doggie Moms,” was also in attendance with her celebrity dog, Eli the Chihuahua. “I found the NEDA walk to be very moving and inspiring. Even for those not directly affected, the presentations and walk were a soulful reminder that no one should ever lose a loved one from something like this,” said Biehl. 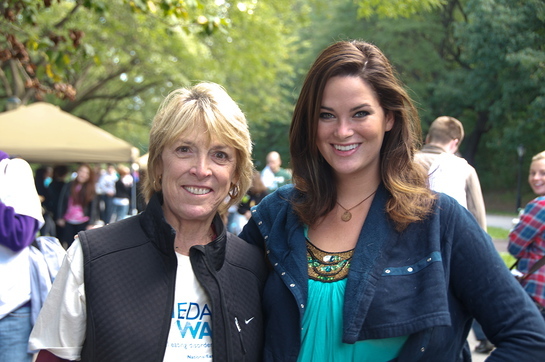 The NYC NEDA Walk was chaired for the second year in a row by WABC-7’s Diana Williams. It included a mile stroll along the Riverside Park Promenade and an exhibition throughout the day full of vendors, such as WPLJ radio, massages, t-shirt decorating and more. The theme for the NYC NEDA Walk as “It’s Time to Talk About It; It’s Time to Walk About It!” because it truly is the time.